490 pages | 65 B/W Illus. Primary elections have been used for the past century for most U.S. elective offices and their popularity is growing in other nations as well. In some circumstances, primaries ensure that citizens have a say in elections and test the skills of candidates before they get to the general election. Yet primaries are often criticized for increasing the cost of elections, for producing ideologically extreme candidates, and for denying voters the opportunity to choose candidates whose appeal transcends partisanship. Few such arguments have, however, been rigorously tested. This innovative Handbook evaluates many of the claims, positive and negative, that have been made about primaries. It is organized into six sections, covering the origins of primary elections; primary voters; US presidential primaries; US subpresidential primaries; primaries in other parts of the world; and reform proposals. 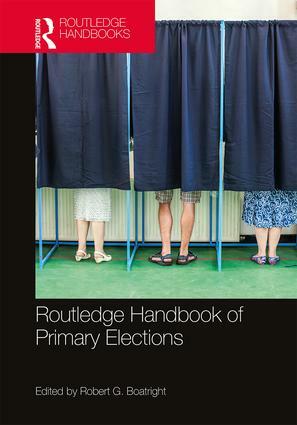 The Routledge Handbook of Primary Elections is an important research tool for scholars, a resource guide for students, and a source of ideas for those who seek to modify the electoral process. What is, and what is not, a Primary Election? Divisive Primaries: When do They Hurt in the General Election? Is there a Link Between Primary Competition and General Election Results? When Might Moderates Win the Primary? Robert G. Boatright is a Professor of Political Science at Clark University and the Director of Research at the National Institute for Civil Discourse (NICD) at the University of Arizona. His research focuses on the effects of campaign and election laws on the behavior of politicians and interest groups, with a particular focus on primary elections and campaign finance laws and practices.